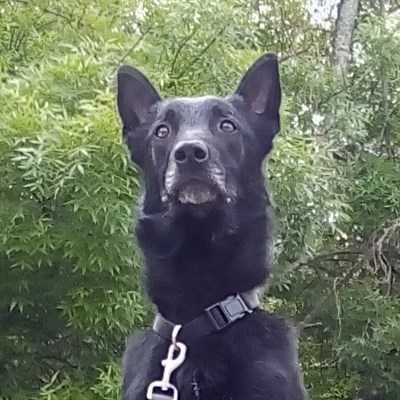 Calvin is a 3 year old black Belgian Malinois. Calvin was surrendered to us when his owner just didn’t have the time to spend with this active young boy. Calvin is housebroken and crate trained but according to his foster, he is completely trustworthy being loose in the house. Calvin is dog friendly, but mostly indifferent. He lived with a young female GSD and even though they got along fine, his main focus was and is to his person. Calvin is a confident Mal who is very affectionate to his people. Even though not always appreciated, Cal likes to give people the Mal hug where he wraps his front legs around your waist. For this reason, Calvin is best in an adult home or one with older children. Calvin will make an active person a wonderful companion. He is athletic would do well in agility due to his lean body frame and would make a great running partner. Calvin will need a home where he will get sufficient exercise as being a typical Malinois, he is high energy and likes to be on. Calvin has had some formal training and knows all his basic commands so he would be a great dog to continue in training. If you think you have the energy to keep up with this boy, we would love to see Calvin go to a home where his energy and wonderful temperament will be embraced.Calvin is currently living in a foster home in San Jose.